Does anyone from remember hearing the interesting story of George Ladbrook? And does anyone know anything more? He was born in little Wakering in 1893. George became chauffeur to King Edward VIII. After the abdication George drove Edward Duke of Windsor and Mrs Simpson on their honeymoon and it was he who drove them out of France during World War 2. George and the Duke became friends. The Duke was godfather to the Ladbrook boys and often visited them in their home in Barling. He gave them gifts and invited them to special Christmas parties. 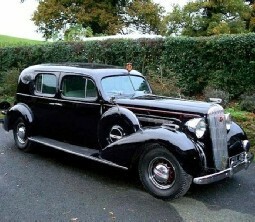 George was often known to use the King's Buick car when not on duty and garaged it in a barn in Barling. George worked for Edward for 18 years. (RDCA-Admin) See also the detailed article about George entitled "King of the Road" on Richard Kirton's Barling & Wakering site.